(OUTscene NW) RE-view: On horseback or in the air, Cavalia delivers! It had to be one of the most unintentionally ironic moments in recent stage history. During a 45-minute preview of Cavalia Tuesday, it started to snow. Not just outside at Redmond’s Marymoor Park, but inside the show’s 110-foot-high big top. This was minutes after creator Normand Latourelle announced that Wednesday night’s opening show might have to be postponed because of the snowstorm expected to wallop the region. It wasn’t real snow – just part of the show’s special effects. Cavalia packs lighting, music and performers. READ the Full RE-view Here! 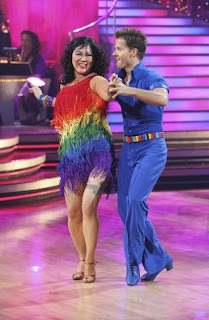 (OUTscene NW; INTER-view) Comic Margaret Cho talks singing, 'Dancing,' gay rights and Bristol Palin! No one can accuse comedian Margaret Cho of being a wallflower. She takes the stereotype of the demure, passive Asian female and turns it completely on its head, cutting through one taboo subject after another in her stand-up act. That’s one of the reasons her audiences love her. The fiercely liberal comic is appearing Friday night at Tacoma’s Pantages Theater. Though she is married to a man (artist/writer Al Ridenour), Cho describes herself as queer and has been a tireless champion for LGBT causes. On Friday night, she’s hosting a $100-per-person meet-and-greet prior to her show as a fundraiser to support Equal Rights Washington’s campaign for marriage equality in Washington state. The Tacoma News Tribune interviewed Cho in advance of her Tacoma appearance. You can read more of the interview Here!